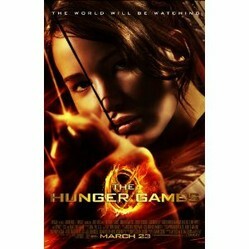 The Hunger Games is the upcoming craze of the young generation! With the fame of the trilogy and the blockbuster movie release, every kid would definitely want a Hunger Games Theme for their next birthday party. To help you find the most appropriate supplies for your party, i have assembled this page. You will find the perfect party supplies and decoration ideas here to set up a Hunger Games Party. 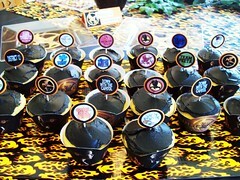 Plan a Hunger Games Party! 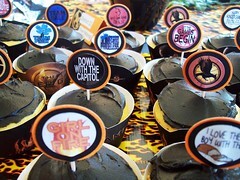 With the new Hunger Games movie released, the demands for a Hunger Games Themed Birthday Party will increase. Teens would be more than excited to be the first of their friends to host a party with this new theme. Here I will let you know some great ideas to plan your hunger games party on a low budget. As official hunger games party products have not yet been released, you will have to plan the party so that everything fits in perfectly with the theme. 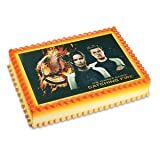 Read on to find out the best ideas for creating Hunger Games party invitations, party table supplies, room decorations, favour ideas and lots and lots of Hunger Games gift ideas. Surprise Your Teen With Poster Set! This limited edition poster set contains 8 posters based on the movie characters. 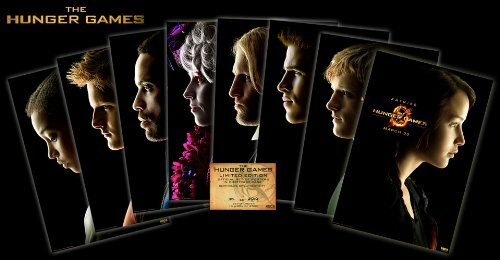 It contains a poster each of Cato, Effie, Haymitch, Cinna, Gale, Katniss, Peeta, and Rue. The product comes in a flat box so you don't need to worry about it being damaged on the way! Hunger Games Costumes will be popular choice for teenagers this year. Get to know how to dress up like Katniss Everdeen by spending as little amount on new clothes as possible. Not Available?... Make Your Own! Hunger Games party invitations are not yet available in markets. But don't let that disappoint you! 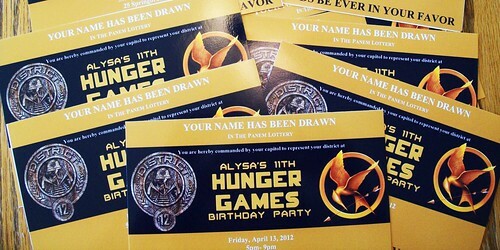 I will tell you the simplest way of designing some fabulous Hunger Games Invitations yourself. 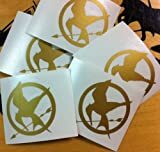 As the Hunger Games is mainly featuring Mockingjay and Flame logos so you can use those to make the perfect party invitations for your party. All you will have to do is buy some black and orange chart paper or plain greeting cards and stick the stickers on them. The flame stickers can be placed on the bottom end of the card to give the look of a burning arena and if you place the mockingjay between the flames it will give you the perfect Hunger Games look. You can use orange lead or paint markers to write the details of the party. The Hunger Games Official Stationery Kit Includes 3 colored pages with envelopes featuring Katniss, Gale & Peeta. You can use these to make special invitations. 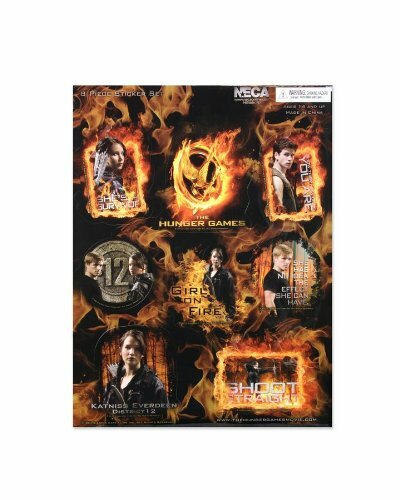 Decorative Hunger Games stickers are also included in the pack. The photo shows the contents of the pack. 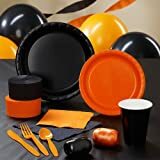 The Hunger Games Flame theme will be complimented best by this orange and black party set. 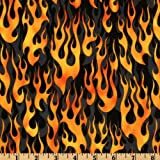 You can get a Flame Tablecover to cover the table or a simple black cover with an orange runner will also do. The party pack featured here will fulfil your needs for 24 guests. It contains 24 Dinner Plates, 24 Dessert Plates, 24 Paper cups, 50 each of Lunch and Beverage Napkins, a 72 peice cutlery set with 24 each of forks, spoons and knives. It also has decoration items like a Table cover, 12 latex balloons, 2 colored crepe streamers and 2 colored curling ribbons. This set will be an ideal purchase for a Hunger Games party. 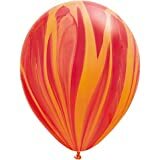 This orange balloon gives the Flaming look we are looking for decorating the party. 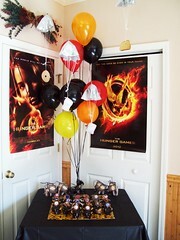 These balloons will be a must have for the Hunger Games Party you are planning. They will look great rolling on the floor or you can add bunches on the back of chairs. Don't forget to add some extras to the party favor giveaways! The Hunger Games Merchandise has spread surprisingly fast. Movie based products have been released for fans. The Hunger Games Stationery sets will make the perfect party favors for your birthday party. The Stationery sets have Barrel Pens, Mechanical Pencil & Pen set and a full stationery set for kids including a folding ruler, pencils, eraser, sharpener and a hunger games pin which features Katniss, Peeta and the District 12 logo. Other party favors can be a set of movie themed stickers or the flame balloons we mentioned above. The Hunger Games Party will seem incomplete with some themed games to enjoy playing. KIds would love to have these Strategy Games to spend their time playing. You can get these as a surprise gift for the Birthday kid! The Jabberjay Card Game is a movie based game which plays 5-12 players in which each player represents a District or Capital Citizen whose identity remains secret during most of the game. The players attempt to discover each other's identities and ultimately to force their opponents to flee. It also has a 2-4 player game in which the players work together to protect the district citizens from peacekeepers. The other one is a book based game which is based on the last book of the trilogy It has 18 Tribute cards, 45 Challenge cards, 4 Reminder cards, 3 Dice, an Approval Rating Card Effort token and some score tracking tokens. A Hunger Games Party will be incomplete without a menu that fits the movie theme. 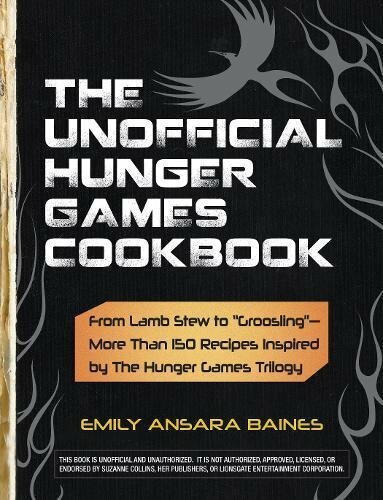 The Unofficial Hunger Games Cookbook is the first of it's kind to be released. It includes all the recipes the characters love the most. You can add some of these and make your party an instant hit!